I’m in Washington, DC, on business, but I had a little less than an hour for escape. Since my hotel is around the corner from the Smithsonian American Art Museum, I popped in largely because I’ve loved its collection of folk art in the past. Those works are still wonderful, but I also came across a wonderful, tiny exhibition that seems to have attracted no attention. Lists, To-dos, Illustrated Inventories, Collected Thoughts and Other Artists’ Enumerations is curated by Liza Kirwin, who looks after manuscripts in the Smithsonian’s Archives of American Art. It’s small, with perhaps 40 objects. Many of them are of little or no artistic distinction. But it’s absolutely engrossing. Kirwin had the wonderful idea of bringing together artists’ lists on all sorts of matters — Elaine de Kooning’s 1954 notes for a joint tax return (from sale of pictures $9,632), Harry Bertoia’s self-rating chart from 1932 (“fair” for quickness of thought and courage, “excellent” on neatness, accuracy and health), Joseph Cornell’s 1957 list of items purchased at an antiques show (“Red Riding Hoodish painted red, green, blue its charm the paint much worn”). 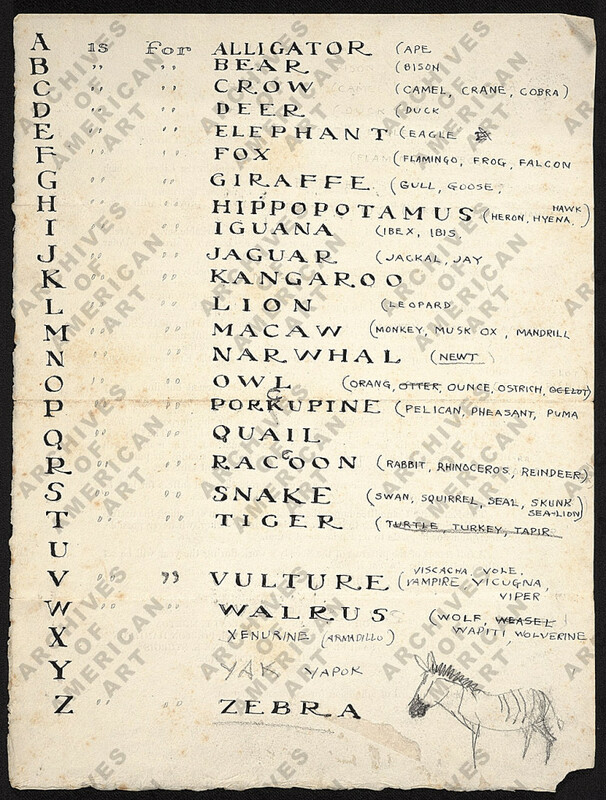 Shown above is Paul Bransom’s alphabetical list of animals. I’m not sure there’s a lot to be gained by analyzing just why lists are so interesting (at least to me). If you happen to be in Washington, however, I urge you to go to this one-room exhibition. A good second best is the excellent book of the exhibition, which includes about 30 items not on show. This entry was posted in Uncategorized on March 17, 2010 by lance.